Companies racing to develop self-driving cars for American roads have hit their first potholes. Google acknowledged Monday its self-driving vehicles have been involved in four car accidents since September and 11 overall during six years of testing. Global automotive supplier Delphi said its autonomous cars have been involved in one minor accident. 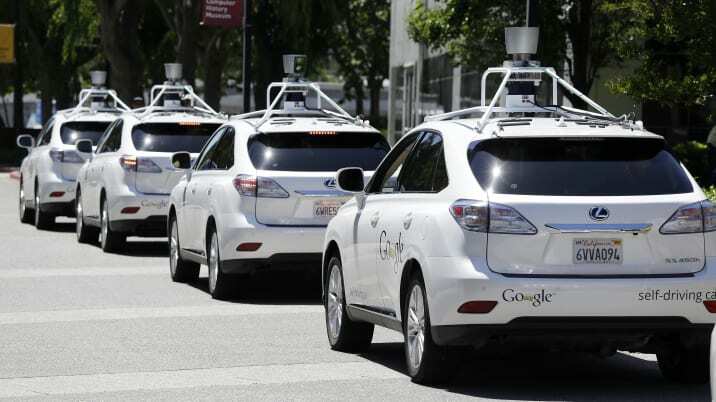 Fears over the safety of self-driving vehicles have reached a fever pitch since the release of those figures, but those concerns may be overblown. It's the data that can be harvested from these vehicles that should worry people more. Automakers already collect and store location and driving data from millions of cars on the road today. In the approaching era of self-driving vehicles, privacy advocates fear the data collection will grow more intrusive. The more sensitive the data, the more lucrative it might be for a company like Google, says John Simpson, an advocate with California-based Consumer Watchdog. "Once this technology is widely adopted, they'll have all sorts of information on where you're driving, how fast you're going, and there's no control over what Google might do with it," he said. Personal information is already collected by automakers, according to a report issued by the Government Accountability Office last year, which found there were not adequate consumer protections in place. In the wake of that report, AAA, the nation's largest motorist organization, called for car companies to adopt a consumer bill of rights that set stricter privacy standards. In the hands of a company like Google, which earns the majority of its revenue from advertising, Consumer Watchdog said there's even more cause for alarm. "There's broader privacy implications," said Carmen Balber, the nonprofit's executive director. "How often do you happen to drive your car to a liquor store, and will that information be provided to your insurance company? Will information on where you spend your Saturday nights be subpoenaed in a divorce proceeding?" Twelve automakers have pledged to provide more transparent notices to consumers about what data is being collected, minimize the scope and time of storage and prohibit information from being given to law enforcement without a court order. Google was not one of the companies that signed the pledge sent to the Federal Trade Commission. On Tuesday, a Google spokesperson told Autoblog the self-driving car program is being tested for engineering purposes only, and that it is not seen as an ad-supported business model. When self-driving cars reach consumers' hands in the future, the company said it would adhere to its posted privacy standards and policies. In California, legislation to provide a framework for how automotive companies use this sort of data in the future was proposed last year. The Consumer Car Information and Choice Act would have required car buyers to be notified that their vehicle information is collected by automakers and given consumers the right to access and control whom that information was shared with. But automakers opposed the bill and it went nowhere. "We think Google is particularly problematic because of the nature of the business they're in," Simpson said. "Some of these things can be mitigated when people understand what's being offered and informed. ... But the bottom line is we don't know what companies are doing with this data, because the companies won't tell us." Transparency was also an issue in the company's release of its self-driving accident numbers. In a written statement, Google says its self-driving technology did not cause any of the accidents. In a "vast majority" of the accidents, other cars struck the Google vehicles, which have logged more than 1.7 million miles of operation. Google says all the accidents were minor, and involved no deaths or injuries. The statement leaves room for interpretation. Were safety drivers operating the cars in manual mode in accidents not part of the "vast majority?" Were they at fault in those accidents? The circumstances would be clearer if the company released the accident reports, so they could be verified and further examined. Delphi released the police report from its lone accident in October 2014, and it notes the self-driving car was stopped at a traffic light waiting to make a left turn when it was struck by another vehicle. Though the touted safety benefits of self-driving cars should not be a foregone conclusion, as a recent University of Michigan study points out, there's no evidence that suggests self-driving cars are running amok on California roads. At least for now, the self-driving cars have an unblemished record in protecting life and limb. It's how they protect data that's the bigger question.